You’ve probably heard of the tiny house trend, but you may be wondering what exactly is a tiny house? And what’s driving their growing popularity? A tiny house is typically anywhere from 100 to 400 square feet — significantly smaller than the size of the average American home which is about 2,000 square feet. They can be on land or on wheels and come in many different shapes and sizes. While tiny houses are true to their name, they are usually large enough to include the basics, such as a sleeping room, bathroom, kitchen, storage area and a place to sit back and relax. On the flip side, tiny homes encourage minimal and efficient living, forcing residents to take a look at the things they need versus what they want. Tiny houses went mainstream with several television series chronicling the movement. Shows like “Tiny House, Big Living,” “Tiny House Nation” and “Tiny House Hunters” spotlight what it’s like to switch to a simpler lifestyle and downsize – drastically. The shows demonstrate the appeal of living with less and gained the attention of thousands of viewers. 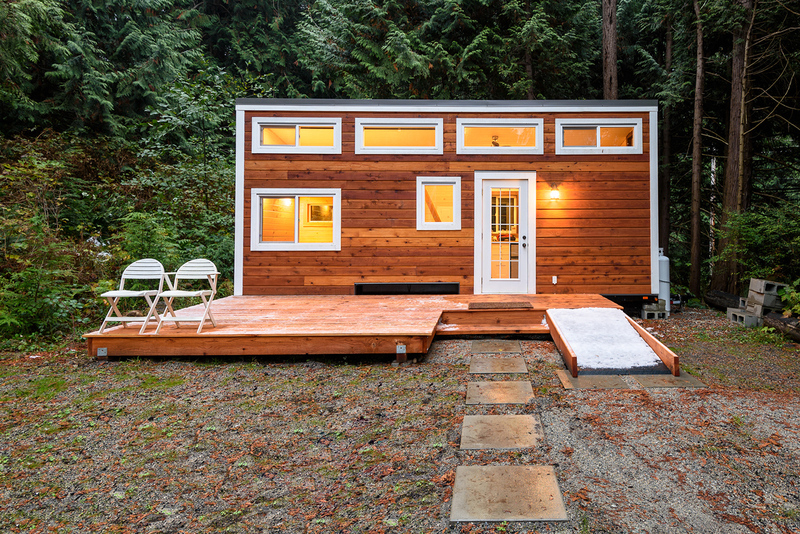 With the popularity of tiny house shows rapidly growing, blogs were quick to follow. Many tiny homeowners share their experience and knowledge of tiny homes on personal blogs. In fact, a Google search of ‘tiny home blogs’ yields about 147,000,000 results! You can learn about anything from tiny houses for sale, to tiny house prices and even tiny house hunters. Now that you’re in the know about what tiny houses are and their growing popularity, you may be wondering, what’s the big draw? Experts believe the tiny house boom came about as more homeowners found themselves living paycheck-to-paycheck trying to get a handle on their mortgage payments. According to The Tiny Life, the average cost to build a tiny house is $23,000, while the average cost of a standard-sized house is approximately $272,000, which may explain why nearly 68 percent of tiny house residents are completely mortgage-free! Additionally, tiny homes are typically environmentally friendly. It’s easier to power these homes in natural ways because of their small size. And even if you use a more traditional form of energy, it requires much less power than the average-sized home. On top of all this, tiny homeowners tend to live healthier lifestyles. Since tiny houses don’t include much room for food storage, residents are more likely to consume fresh food right away, leading to healthier choices and lifestyles. While there are numerous benefits to tiny house living, it’s not right for everyone. Locations where the idea of a tiny house is appealing — high density, metro areas — may not be as economical because of the high land costs. So if your goal is to save money, you’ll have to find land where prices are low and typically away from major commuter routes. And keep in mind, while you may save money on your power bill, your cable and internet bills will likely remain the same. Plus, tiny homes often use more expensive materials during construction, which can drive up costs. It’s clear that tiny homes are catching steam, but who’s really buying them? According to The Tiny Life, two of out five tiny house owners are over age 50, and 55 percent of tiny homeowners are female. Experts say these homes appeal to the over 50 crowd because they’re a viable living option for residents with little savings and tiny house plans can be customized based on residents’ needs. Plus, the reduced maintenance and added benefit of mobility is a big draw. “While each of those benefits is helpful to any homeowner, they’re especially valuable for an older adult who isn’t up to taking on major home maintenance work, is on a fixed budget and both wants and may need the flexibility to adapt to whatever the future brings,” according to AARP. But that doesn’t mean tiny homes only appeal to an older crowd. A tiny house can also serve as a starter home for a young couple who cannot afford a traditional home, or they can be perfect for someone who wants to spend time near the beach and only needs a living space, or as an affordable living area for a caregiver. Additionally, many residents are purchasing tiny houses for their in-laws, so they can be nearby but still maintain their own personal space. What Implications Do Tiny Houses Have for Real Estate? As tiny homes become more common, many are questioning what this means for the real estate industry. Is the trend more boom or bust? The Pew Charitable Trust says, “Tiny homes are cheap and energy-efficient but lost in the enthusiasm is the fact that in many places, it is hard to live in them legally,” adding that finding land is difficult, especially in communities with strict zoning laws. Not to mention, financing can be especially complicated. Some lenders have minimum loan amounts and offer loans for homes on permanent foundations only. Another option is to take out a personal loan. Our sister company, Rocket Loans, offers non-restrictive, personal unsecured loans ranging from $2,000 to $35,000. Despite some uncertainty, more and more tiny home communities continue to pop up across the country, with especially dense populations in Colorado, Florida, Texas, Wisconsin and California. The buzz around tiny houses is apparent, but the jury is still out on whether the demand will keep up with the supply! Would you ever buy a tiny home? Share your thoughts in the comments section below! Or if you’d like to search regular-sized homes, check out listings that are for sale by owner.